A true gem of Chinese Buddhist mural painting is to be found in the Beijing Western Mountains in a monastery of the Chan tradition, the Fahai Chan Si ("Chan Monastery of the Sea of the Law"), which because of its eminent importance was recently declared as a national treasure. Dazzling with its rich display of colours and stucco reliefs covered with layers of gold, the outstanding features of the Fahai Si murals are their artistic quality, iconography, cultural and historical value, and state of preservation. This richly illustrated study analyses the pictorial program of the murals in the main sanctuary, focusing on life-size portraits of the "Twenty Deities," which surround the main altar in procession. 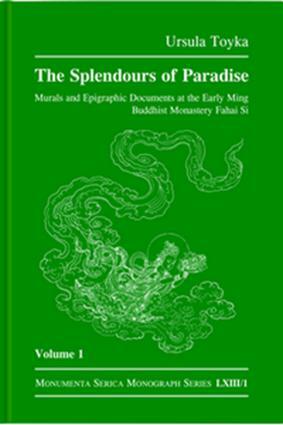 Based on the earliest extant textual evidence, the author explains the iconography and ritual function of this unique representation in the Buddhist world, identified in rare instances by other representations. The entire set of the Fahai Si murals are comparable in concept, style and composition to related religious paintings, news of which had earlier never reached outside China. Contributing to a contextual understanding of Chinese painting history, the study reveals activities of a so-far unknown imperial painting workshop and Tibetan Buddhist influences present in 15th century Beijing. An extensive corpus of inscriptions on stelae, pillars and a bronze bell preserved on the temple grounds is for the first time completely translated and understood as a record of the stunning history of this monastery in the context of Ming dynasty temple building. The cross-cultural character of this project sponsored by the imperial court elucidates an important period of post-medieval Buddhist art and society in China.